Net neutrality has been back in the news in a big way following the D.C. Circuit Court’s decision in Verizon v. F.C.C. to strike down many key provisions of the agency’s open-internet rules. The decision was a monumental one, but far from then end of the debate with President Obama indicating Friday that he expects the FCC to revisit the issue in some fashion. The immediate fallout from the decision and what happens next remain to be seen, but in the meantime here’s a few links from around the web covering the issue from a variety of perspectives. Professor Robert C. Hockett has been exploring the idea of using eminent domain as a way to relieve underwater mortgages in several of his recent publications. The research is more than just theory, as the city of Richmond, California took steps this summer to put such a plan into action, while several other municipalities are exploring the idea as well. The Scholarship@Cornell Law repository is featuring one of Professor Hockett’s recent publications on this topic titled: “A Federalist Blessing in Disguise: From National Inaction to Local Action on Underwater Mortgages”, originally appearing in the Harvard Law and Policy Review earlier this year and co-authored with John Vlahoplus of the advisory firm Mortgage Resolution Partners. For more on the latest scholarly articles from Professor Hockett and the rest of the law school faculty visit the repository at Scholarship@Cornell Law. Perhaps you’ve heard the federal government is currently shut down? With budget negotiations at an impasse, and another debt ceiling battle looming, the Scholarship@Cornell Law repository is featuring two articles published by members of the law faculty that touch on these respective issues. Professor Josh Chafetz’s essay “The Phenomenology of Gridlock,” turns the conventional dysfunction narrative on its head, arguing that the hunt for causes of gridlock are misguided. Originally appearing in Notre Dame Law Review’s 2012 “The American Congress: Legal Implications of Gridlock” Symposium, Chafetz argues that gridlock itself is not a phenomenon, but an absence of it, and that looking at why and how legislation occurs is the more fruitful course of action in determining institutional dysfunction. Also, Professor Michael Dorf and George Washington University’s Neil H. Buchanan tackled the debt ceiling fight last year in companion articles “How to Choose the Least Unconstitutional Option: Lessons for the President (and Others) from the Debt Ceiling Standoff” and “Nullifying the Debt Ceiling Threat Once and for All: Why the President Should Embrace the Least Unconstitutional Option” appearing the Columbia Law Review and Columbia Law Review Sidebar respectively. In the papers, Dorf and Buchanan examine the recent history of the debt ceiling brinksmanship between Congress and The White House and examine the options the President may have to prevent the ceiling from becoming a negotiation tactic every time it needs to be raised. Additionally, visit Professor Dorf’s blog, Dorf on Law, where he’s been posting on the current budget negotiations. For more on the latest scholarly articles from these authors and the rest of the law school faculty visit the repository at Scholarship@Cornell Law. If you’re not yet familiar with Regulation Room, it’s designed and operated by the Cornell eRulemaking Initiative (CeRI) and hosted by the Legal Information Institute (LII). CeRI experiments with how Web 2.0 outreach and participation technologies can expand the kinds of voices that take part in federal agency policy-making. Regulation Room visitors will find the 800+ pages of CFPB explanation organized and condensed into 10 “issues posts,” written in plain language with links to a glossary and primary documents. The unique targeted commenting function allows users to link their comments to specific topics, and to have threaded discussion with others. Student moderators, trained in group facilitation techniques, mentor effective commenting and stimulate discussion. Regulation Room will send a detailed summary of the comments to CFPB. Particular target audiences for this discussion are individual consumers and small community banks and credit unions. To learn more about Regulation Room and CeRI, read Cornell University Law School‘s Spotlight and Regulation Room’s About. Online law needs to be authenticated so we can trust that it hasn’t been messed with by mischievous or angry hackers (or worse). Old stuff is important too! Earlier versions of the law need to remain online in a stable location. We shouldn’t be required to cite to commercially-produced versions of the law, which creates a burden for those who don’t have access to Lexis or Westlaw. We need good technical standards for online versions of the law. We need some uniformity in those standards. Governments need to make the law available in a format that can be processed by computers. That way web designers can use the law to develop useful Web sites. The law also must be the official, definitive version. Government needs to fund research into the challenges of putting the law online, including privacy issues. Some government entities, especially at the state and local level, need help complying with these principles. We need a program to educate and train them. 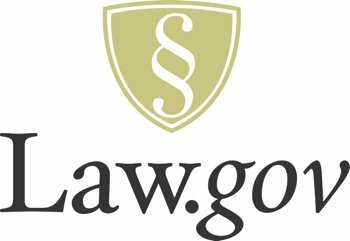 Click here for more on Law.gov. PACER is an online database for downloading copies of federal court filings: complaints, answers, motions, etc. Trouble is, it costs 8 cents per page to download a document. 8 cents may not seem like a lot, but it adds up quickly. PACER also charges 8 cents to look at a page of search results. PACER isn’t the most user-friendly database–you can’t search the full text of documents. You can pretty much only search by party name, court, and docket number, so you have to know what you are looking for. Critics of PACER think the government is overcharging for the service because it makes a sizable profit off documents that are public record (one of the rare government services that actually makes money). A team of talented people at the Center for Information Technology Policy at Princeton developed RECAP (PACER spelled backwards) to help researchers get federal filings for free. RECAP is a Firefox extension (a bit of code that adds functionality to an Internet browser) that automatically archives PACER documents when people who have RECAP download them. Then, if you have RECAP, you can search PACER to see which documents have already been downloaded and are available for free. Now it is even easier to find free federal case filings because the stand-alone RECAP Archive is available–no PACER account or RECAP add-on needed. Pulling up the docket for a case lets you see which documents are available to download for free and which must be purchased through PACER. The Archive is easy to use. Let the RECAP team know if you encounter a bug or have an idea to improve the site. Note that you still can’t search the full text of the filings, only the docket (Hat tip to Erika Wayne at Stanford for posting the clarification). The Archive has some interesting features, like the ability to add tags to dockets and link related cases together. The tags didn’t seem very helpful because I could not limit my search to specific tags. I’m not sure that people will add enough tags to make tags useful for finding cases. An important problem to consider when using court filings from PACER is the availability of personal information like bank accounts and social security numbers in some documents. Sensitive information should be redacted before documents are uploaded into the system but often isn’t due to the huge volume of documents handled by the courts. RECAP’s servers scan documents for social security numbers, but other sensitive information is difficult to identify through automated processes (e.g., names of minor children). RECAP asks that documents with sensitive information be brought to their attention. Ultimately this problem is best fixed by the courts, possibly by limiting the inclusion of sensitive information to one designated filing type for all cases and keeping those documents in a separate, secure system. Courts should also consider abandoning entirely the use of paper documents for sensitive information in favor of an electronic database. If you download documents from PACER, consider installing the RECAP add-on so you can contribute to the open access of information. Last week the Government Printing Office (GPO), the Office of the Federal Register (OFR), and the National Archives and Records Administration (NARA) jointly released a new, XML-based version of the Federal Register at FederalRegister.gov. The Environmental Protection Agency corrected the text of its July 15, 2010 Call for Information on accounting for greenhouse gas emissions from bioenergy sources. The new site is in beta. 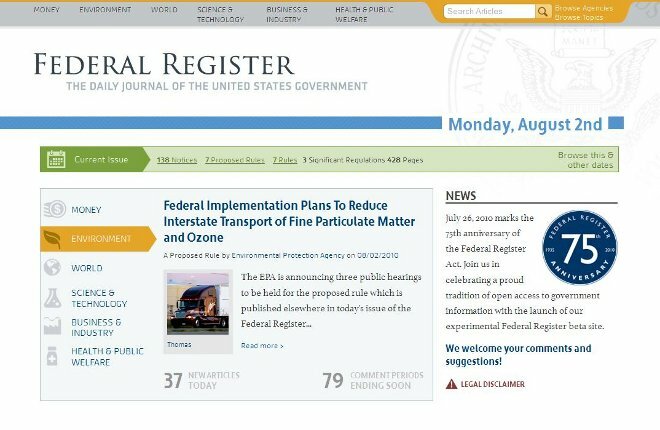 It is an unofficial version of the Federal Register for now, but the site provides links to the official PDF version in FDsys.gov. My favorite new feature is the RSS feed. Feeds are available for all of the index topics like bankruptcy, solar energy, and Iraq. Following the recent revamping of the U.S. Supreme Court’s extremely dated Web site, uscourts.gov just received a new, slicker interface. The new changes are primarily cosmetic but welcome—the site now has a cleaner, more sophisticated look with larger, size-adjustable font. The site is compatible with BrowseAloud, a free program that audibly reads Web sites for people who have trouble reading the text. Other new editions include email updates and an RSS feed of news about the judicial branch of the federal government and videos (the Web site hosts some videos and has a YouTube channel). Videos are directed toward a general audience and provide background information about the federal courts, working for the courts, and bankruptcy information, among other topics. The site also offers text and videos explaining bankruptcy and the bankruptcy process and resources for high school teachers including material for mock trials.